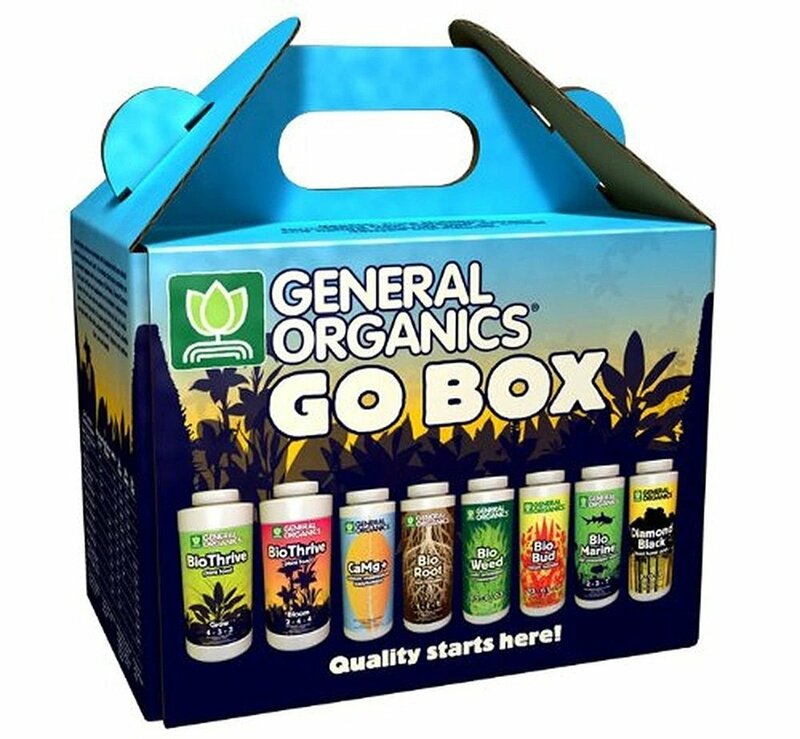 Today I am giving my personal review of the General Organics GO Box, which is a pack of nutrients great for growing top shelf cannabis! The GO Box comes with all the nutrients you will need to grow from seed to harvest, and provides fantastic results. The General Organics Nutrient pack also comes with two extra nutrients, Black Diamonds & Bio Marine, which are great for an added boost to your grow. The best part about the GO Box is it is only $43 and will last you for at least 2 grows. The first thing I would like to mention about my review of this product is I grew in a Coco Coir/Perlite mix and with a pH range of 5.5-6.5. I also used Coco wet as a wetting agent, so my plants would properly uptake everything they needed to grow big and strong. Finally, it is important that you dilute the recommended doses show in the feeding schedule, as the nutrients in the GO Box come extremely concentrated. I usually start out with an eighth of the recommended strength, and then work up to a max of half strength. If you go full strenght, it is very likely you will see signs of nutrient burn very quickly. Diluting the mixture is n easy way to prevent these kinds of problems. During my most recent Super Jack grow, I solely used the GO Box nutrients on the plant and had outstanding results. From one plant using the GO Box, I got just under a quarter pound of cannabis, and that was after being attacked by aphids and being grown through the middle of winter! You can see in the video how the Super Jack buds came out, as I show them once they were dried and cured. They are extremely frosty and the smell is that classic Jack Herer scent. The smoke is also very smooth and tasty, due to proper flushing. The effects are very nice as well, being very heady and not a couch lock type of high. After using the General Organics GO Box Nutrient line for several grows over the last couple of years, I would give this product a rating of 8 on a scale of 1-10. The only reason I didn't give it the perfect ten rating is due to the high concentration of nutrients, which can be difficult to deal with if you are unaware or a first time grower. Besides that one flaw, I would highly recommend the GO Box Nutrient line, as I have always had outstanding results with it! I hope you have enjoyed this product review and as always, Happy Growing!